Lots of people know that products containing Vitamin C will have a brightening effect on the skin but what about other vitamins? Ever wondered what their function is? I'm taking the vitamins from the first five letters of the alphabet today and recommending products for each one! Vitamin A: This really is a wonder ingredient in skincare. Its benefits include plumping the skin to diminish the appearance of fine lines and smooth wrinkles, and it stimulates cell renewal, which in turn leaves the skin tone even and glowing. It also helps to clear spots and blemishes. Everyone would benefit from adding some Vitamin A products into their routine. 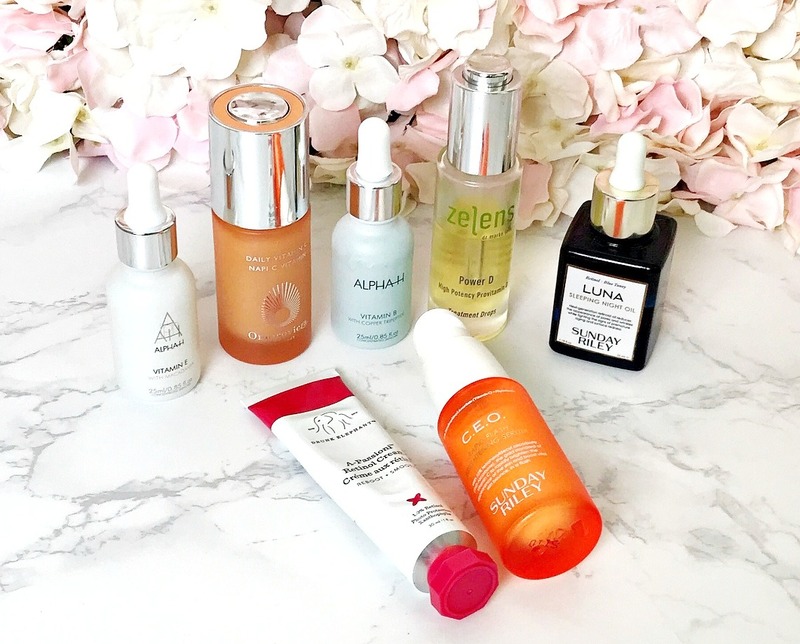 My recommendations: Sunday Riley Luna Sleeping Night Oil and Drunk Elephant A-Passioni Retinol Cream. Vitamin B: Also known as niacinamide, Vitamin B3 strengthens the skin's barrier, which protects against environmental damage and prevents moisture loss. It also has anti-inflammatory properties, which makes it ideal for reactive or acenic skin. My recommendation: Alpha-H Vitamin B.
Vitamin C: This vitamin boosts collagen production, which plumps the skin. It also inhibits melanin production, which lightens areas of hyperpigmentation and brightens skin overall. It also encourages cellular renewal, which in turn leads to firmer skin. My recommendation: Omorovicza Daily Vitamin C and Sunday Riley CEO Rapid Flash Brightening Serum. Vitamin D: Another skin barrier protector, this vitamin locks moisture into the skin and protects against environmental aggressors. It boosts skin's elasticity and is an anti-inflammatory therefore all skin types would benefit from it. It is particularly beneficial for those with sensitive or reactive skin. My recommendation: Zelens Power D Treatment Drops. Vitamin E: A powerful antioxidant that protects against environmental damage. It also nourishes and heals dry and flaky skin - perfect if you've overdone it in the sun (which you shouldn't), for patches of eczema or for those with parched skin. My recommendation: Alpha-H Vitamin E.
Obviously, it doesn't end there in terms of vitamins in skincare products and benefits. Vitamins F, K and H are beneficial too, to name just a few. Some vitamins work well in conjunction with each other - C and E, for example. Also, it's generally advised not to use Vitamin A and C at the same time. Generally, I find that I can't use a Vitamin C product on a daily basis but this serum is the exception. Vitamin A is one that you need to use sparingly initially and then build up frequency. Ultimately, through trial and error, we all get to know what's best for our skin and how often we can use an ingredient regardless of what the directions on a product say but when introducing a new product that is active, I personally proceed with caution because despite using acids for years, my skin is still reactive. Which vitamin features most frequently in your skincare routine and which one do you love the most? I'd love to hear! All products are bought by me, unless otherwise stated. The Omorovicza serum was kindly sent to me. Opinion is always my own. Affiliate links may be used.